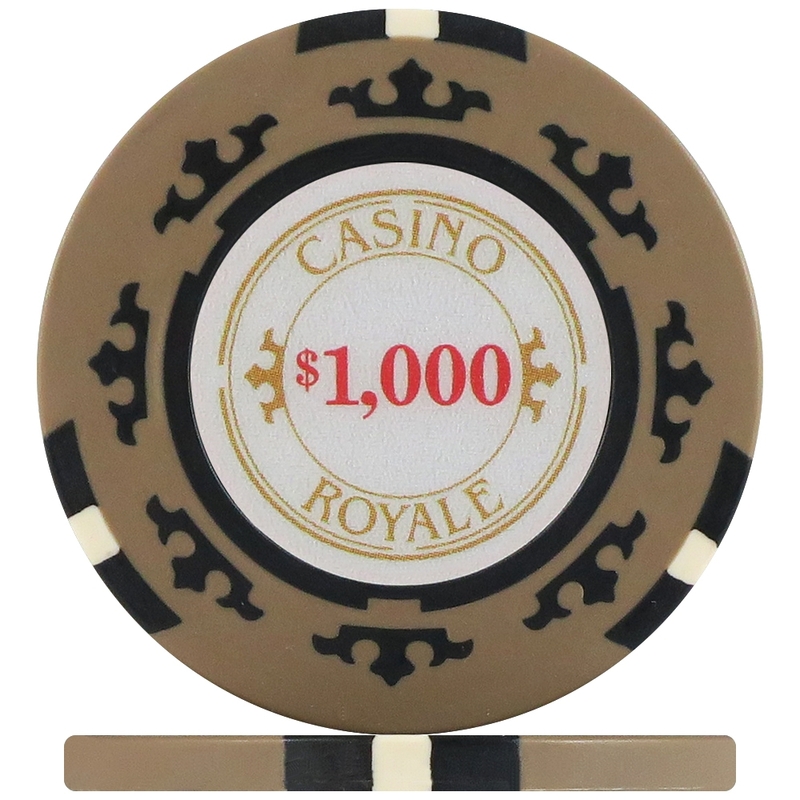 Notify me when " Casino Royale Poker Chips - Beige $1,000 (Roll of 25) " is back in stock. Supplied in rolls of 25 poker chips. 3 Colour construction, Beige/Black with Cream Accent. Made from a clay composite material. Features an 8 crown and 3 tab design. Each chip has an embedded number $1000 decal on both sides. These unique Crown Casino Royale 14g Poker Chips in Beige with value $1,000 are a new addition to our range and exclusive to Premier Poker Chips - You won't find them anywhere else!! They are a very good quality 3 colour construction clay composite poker chip and weigh in at an impressive 14g. The 8 crown and 3 tab design surrounds an embedded Casino Royale '$' numbered decal both sides of the chip. Available in single rolls of 25 poker chips and in various cased poker chip capacity. Cased sets include Crown Casino Royale Poker Chips, 2 packs of 100% plastic playing cards, dealer button, blind button pack, 5 dice and 2 cut cards. If you want a product that will impress then look no further, buy online here in the UK and take advantage of our fast delivery services.